Observing the Outbound 44 from the dock at the United States Sailboat Show in Annapolis, Maryland, I was struck by the robust deck hardware and the utilitarian nature of the design. The boat looks serious, almost too serious, with its beefy stemhead fitting and stainless steel handrails. It is easy to misconstrue the Outbound as just another heavy offshore boat tabbed as a "performance cruiser" for marketing purposes. But that's not Schumacher's style, or Phil Lambert's, the inspiration behind and importer of the Outbound 44. Lambert had a clear vision of what he wanted in a cruising boat. Working with friend Craig Chamberlain, who drew the original lines for the 44, Lambert put good all-around performance high on his list with building a rugged solid fiberglass hull the main critera. "Solid hulls are still the choice for most serious offshore cruisers," Lambert said. "I appreciate saving weight where possible but not at the expense of hull strength and durability." A solid hull with moderate displacement does not have to be slow. Speed, especially passagemaking speed, is a combination of many factors not the least of which is the motion of the boat. A boat with a soft ride will be able to reel off miles when conditions deteriorate while a bouncy, light boat will need to be seriously depowered to maintain control and limit crew fatigue. The Outbound 44 has a nicely balanced underbody. Schumacher's lines include a relatively long waterline, moderate beam and displacement and an internally ballasted fin keel with a moderate cord length and a balanced rudder. The displacement/length ratio of 190 compares favorably with the J/42's 186 and the X Yachts 442's 192. The double-spreader rig has an air draft of 65 feet, although owners of Outbound 44s on the East Coast usually shorten the rig a few feet to make clearing fixed bridges a little less hair-raising. The working sail area of 1,083 square feet translates into a sail area/displacement ratio of 18.75, which is comparable to the Sabre 452. The Outbound 44 is built in Shanghai, China, by Hampton Yacht Building Co. Lambert includes a trip to the factory as part of every sale. As noted above, the hull is solid, hand-laid fiberglass with Knytex biaxial cloth used in high-impact areas. Vinylester resin is used in the outer layers to prevent osmotic blisters. The hull is supported by an impressive series of floors and longitudinal stringers. A one-piece, 6,500-pound lead casting is fitted into the keel cavity and glassed over from the top. Although internal keels are becoming endangered, I still prefer them on cruising boats. In the event of a hard grounding the load is transferred throughout the keel area, as opposed to directly to the keel bolts as is the case in a typical external ballast arrangement. The Outbound 44 keel section does include two externally fastened lead shoes that form a bulb along the bottom of the fin keel. This bulb, which is glassed over, places extra weight right where you want it, as low as possible, resulting in a lower center of gravity and a higher righting moment. The hull-and-deck joint is on an inward flange and is both through bolted and sealed with 3M's 5200, a time-tested marriage. The deck is cored with Baltek balsa. Bulkheads are fitted after the deck and hull are joined, and glassed along their entire perimeter. Furniture facings are also laminated directly to the hull and bulkheads, adding to the solid structural matrix. Lambert points out that almost all materials are shipped from the United States to China and quality control is strictly maintained. Hardwoods and lead are about the only raw materials that come from Asia. The Outbound 44 cockpit is well suited for passagemaking. It is relatively narrow and deep, providing shelter in nasty weather and good support in a seaway. Still, the seats are long enough to stretch out on and the seat backs are comfortable. The wheel is located well aft, as are the primary winches, allowing the helmsman to control the headsail sheets without too much fuss. Many cruising boats in this size range have center-cockpit deck arrangements, but there are advantages to an aft cockpit. For one, they're dryer when sailing upwind. Secondly, they look better, but that's just one man's opinion. The cockpit features a walkthrough transom and a swim step. 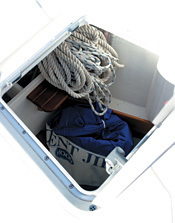 The liferaft is stowed under the helm seat, and there is also a dedicated locker for the outboard motor. One of Lambert's design criteria was to provide enough locker space on deck to properly stow cruising gear, instead of lashing it to rails. The standard rig is a double-headsail sloop, with an optional staysail stay. A double-headsail sloop is different from a cutter. Typically the outer stay will carry a No. 1 furling genoa, used when reaching offshore. 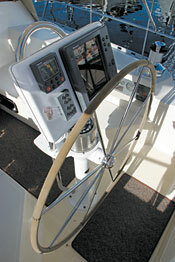 The inner stay will carry a flat cut working jib for upwind work or when the conditions pipe up. This is also the headsail to use when short tacking. If the working jib is also furling it can be effectively reduced to about 70 percent when it really starts blowing. If conditions turn ugly, the staysail stay can be deployed, and a storm jib hanked on. This flexible sail plan is terrific for passagemaking. 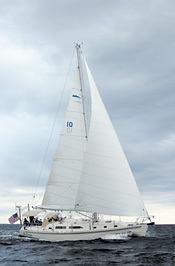 The standard aluminum mast features two spreaders and continuous 1-by-19 stainless standing rigging. However, at least one boat has been fitted with a carbon mast, and others have opted for furling masts or booms. The sailing and safety gear on deck is robust, from large dorades with stainless guards to beefy pulpits and well-supported stanchions. The slightly raised deck puts grabrails at a nice height as you make your way forward. The molded nonskid provides good footing. One standard feature that I really appreciate is the the large sail locker. Located forward of a watertight bulkhead, this locker is huge and gobbles up sails, fenders, extra ground tackle, rolled up dinghies, etc. It is also the perfect spot to deploy and douse an asymmetrical spinnaker in a breeze. The Outbound 44 companionway is very friendly-three wide, shallow steps take you from the cockpit to the cabin. Although there are a couple of standard interior plans, no two Outbound 44s are just alike. "Owner customization is one of the most appealing aspects of buying an Outbound," explained Melvin and Barbara Collins, owners of Ginger, the boat we test sailed on a blustery Chesapeake day. "We work with each owner to incorporate what they want in the boat," Phil Lambert said. "Most of our owners are experienced sailors." The standard arrangement places the owner's stateroom forward, with a centerline queen berth, and another double stateroom aft to starboard. Variations include changing the centerline bunk to an offset double or a pullman berth, set off to one side. After dropping below, the slightly raised galley is immediately to port. The galley is huge and features a three-burner Force Ten cooker, refrigeration and two stainless sinks. There is plenty of counter space with deep fiddles that double as handrails. The oversized portlights flood the galley with light. Behind the galley, the nav station is forward facing and includes a large panel for instruments, radios, repeaters, etc. The electrical panel is located here as well, and a quick inspection revealed tidy and nicely labeled wiring. Incidentally, two 8D house batteries, located beneath the starboard settee in the saloon, are standard. Aft of the nav station is the utility room, a fantastic use of space for serious cruising boats. This area, which can also be accessed from the deck, includes a work bench and storage area for tools and machinery. Although it's tempting to convert this space into another cabin, it would be a pity. Opposite the galley is a large head with a separate shower that also serves as a convenient wet locker. Across from the head and below the galley is a locker that houses a well organized and wonderfully accessible manifold system. The aft guest cabin is a bit tight but does include a hanging locker and book shelf above the bunk. The saloon features a large table and wrap-around settee to port with a settee/sea berth to starboard. 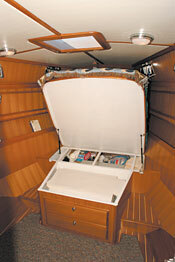 There is storage in lockers above and outboard but also below and behind the settees. A central aspect of the design was to place the tanks in the main bilge. This achieves two important objectives, first it keeps the considerable weight of 200 gallons of water and 160 gallons of diesel down low, and secondly, it frees up the area beneath the settees for storage. The interior of Ginger was bright and cheery with light woods and homey fabrics. Owners specify their choice of hard woods, Corian and fabrics; again, no two Outbound 44 interiors are alike. We had perfect conditions for putting the Outbound 44 through its paces. True winds ranged between 15 and 22 knots and the bay was choppy. With a full main and genoa set we blasted through the budding white caps. I was impressed with the Outbound 44's acceleration and its smooth ride. In the cockpit we were completely dry, and the dodger provided a nice lee from the chilling breeze. Although we were slightly overcanvassed, the helm was not heavy. Before we hardened the sheets we inched up toward 8 knots. We kept good speed up to 40 degrees apparent. Cracking way off, to about 120 degrees, the Outbound 44 really found its stride. Sailing flat and fast, we sped past 8 knots. With the boat zipping along, I made my way below. With no creaks, groans or moans it was like stepping into a library. It was also bright, which has a wonderful psychological impact on the crew when the going turns tough offshore. Making my way around the boat I found hand holds well placed for secure maneuvering. Sitting on the settee, chatting with Phil Lambert, it was clear that the Outbound 44 would be a very comfortable boat on passage. The Outbound 44 is an intriguing boat, a high-quality, bluewater cruiser that performs brilliantly. Compared to other similar cruisers, it's also affordable. If you are serious about offshore cruising, take a hard look at this boat.